A band of thunderstorms came across North Carolina this evening, and our home is drenched. This made it a good night to check the new French drain and gravel path that runs the side of the house. It seems to be working, though a lot of water that runs off the driveway and there’s some puddling still under the big white oak. The shed is leaking, too, even though we paid a guy to patch the roof last summer. When it rains, I have this urge to go outside and evaluate the gutters, the gullies, the puddles, and the pools. As a boy, I would make dams in the mud, and redirect streams into small ponds of my making. As a Peace Corps Volunteer in the Vanuatu, stuck in our house for a week at a time while cyclone rains pounded the tin roof, I moved jars around the floor to catch water dripping through the nail holes in the tin, and I watched nervously from the door as rivers of water and mud formed outside. The rain tonight was welcome, watering the newly seeded lawn all around this solid, dry, silent house. When we visit St. Croix, we often start the day at Polly’s at the Pier, a restaurant in Frederiksted with good coffee and milkshakes and various breakfast items. As the name suggests, Polly’s has an amazing view of the long pier where cruise ships sometimes spend the day and where as a boy I often watched U.S. Navy destroyers and attack submarines tie up. On the wall at Polly’s is a large print of a 1966 edition of the nautical chart of the west end of the island. (Sandy Point, which I wrote about last night, is the peninsula at the lower left.) Last week, I snapped a photo so I could search out a copy of my own. 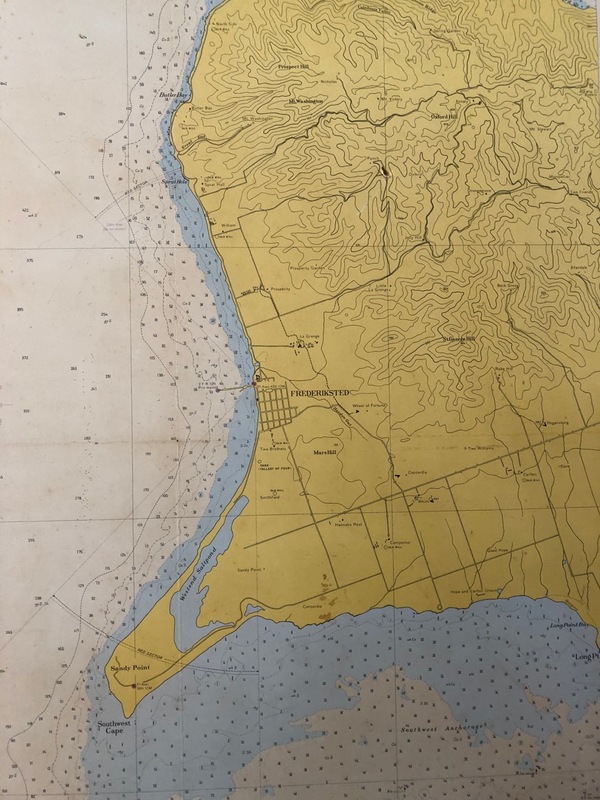 I started my search tonight, and after a few dead ends, found the historical map & chart collection of the United States Office of Coast Survey, part of the National Oceanic and Atmospheric Administration. That collection gave me a high-resolution jpeg of the 1966 chart, as well as versions from other years. Now I can print and frame a copy for my own wall. It’s my birthday, and I’m back home after 10 days in the Virgin Islands, another wonderful return to the island of St. Croix to visit family, the gorgeous beaches of the West End and Buck Island, and the historic towns of Frederiksted and Christiansted. We also sailed on the Roseway schooner, strolled again among the ruins at Estate Mount Washington, and ate mahi sandwiches at Rhythms Bar at Rainbow Beach. This year, instead of celebrating my birthday with the customary tour of the Cruzan Rum distillery (we had been to St. Croix for spring break in 2014, 2015, and 2016), we joined a crowd of a thousand for the celebration of the first year of Leatherback Brewing Company, a partnership led by my step-brother Aaron Hutchins. 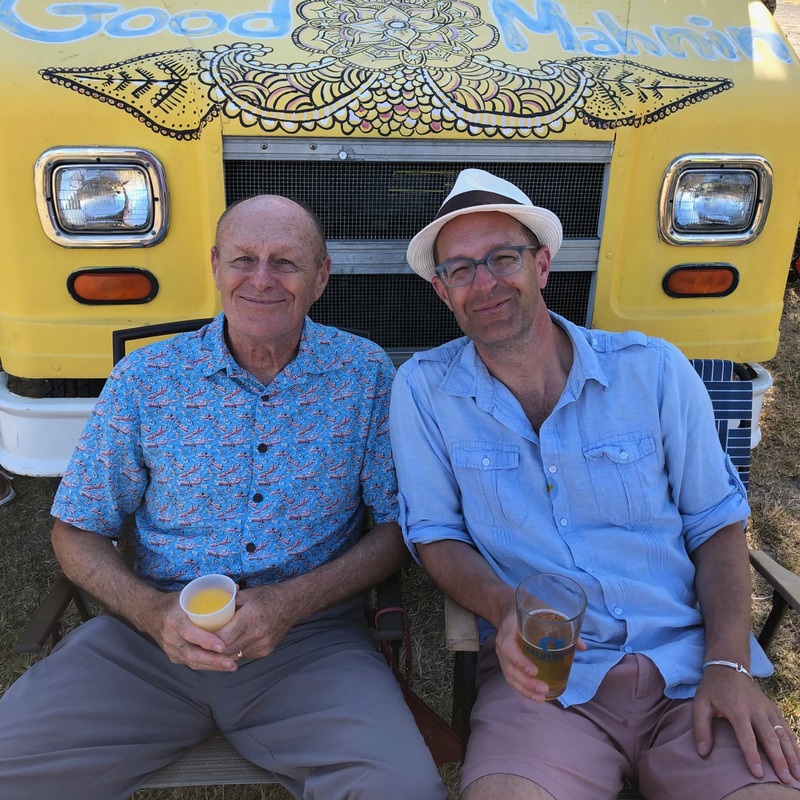 My father with his passion-fruit frozen lindy from Rosa’s Stand and I with a Leatherback brew sat in front of one of the food trucks talking, while Oliver played soccer with other boys and my daughters waited in line for delicious mango sorbet. That night, Dad and Dot would accompany Aaron and his wife to the St. Croix Chamber of Commerce awards dinner, where Leatherback Brewing Co. was lauded as the new business of the year. We were back at Leatherback just before departing the island. I enjoyed the tasty CocoCacao Stout, and Erin and I shared a newly canned Bush Life saison. In between the Saturday party and our Monday departure, we met Aaron and his sons at Sandy Point National Wildlife Refuge for the final public day on that stunning beach before it closed for turtle-nesting season (April through September). Aaron had named the brewery after the leatherback turtles that nest at Sandy Point. Thirty-five years ago, I’d gone with my mother to join a group for a midnight vigil to watch as a massive turtle crawled onto shore, dug a hole in the sand, and laid her eggs. I vividly recall laying in the sand next to the turtle, catching and holding one of the eggs, and then gently placing it inside the nest. Aaron had brought a thermos of cold Backyard Guava IPA made with the juice of guava grown on a tree in his own backyard. We drank that vibrant brew, watching Oliver and Nico roll in the waves. That was a perfect day. Erin and Anna still have a few days on St. Croix before they return, so Malia and Oliver and I went to dinner at Mercato Pizzeria. Malia drove us home, and they surprised me with a chocolate cake. I’ve hit a wall. I’m tired today. No ideas or stories or conversations to chronicle here. Tomorrow’s another day. The Mueller report and Washington intrigue. Science integrity and a major settlement by Duke University. Technology giants and their plans to rule our lives. I’m not in a place to dwell on any of that. I’ve spent today with other people and with different priorities. It’s a day enjoyed for where I am, a peaceful calm far removed from those other issues. That’s well-being, and I am grateful for this opportunity. Even with a dozen big trees now gone from our property, there still will be a lot of leaves to fall from the many dozens of oak, elm, maple, and other trees that remain. The last few times I’ve visited the hardware and garden stores, I’ve looked over the selection of gas-powered backpack blowers, expecting I’d purchase one so that I can keep the yard clear this autumn. But in the April issue of The Atlantic, James Fallows argues against leaf blowers. Their high volume, which I had long considered their most salient feature, is only their second-most-unusual aspect. The real marvel is the living-fossil nature of their technology. And because the technology is so crude and old, the level of pollution is off the charts. Fallows was part of a small group of people and elected representatives to successfully advocate against leaf blowers in Washington, D.C. Kudos to them for making their communities less polluted with gas fumes and low-decibel noise. I knew that two-stroke engines weren’t great for our environment, but I thought, wrongly, that they were getting cleaner. Fallows set me straight, and that’s enough for me to not get one of those backpack blowers. The other facts he shares—about an increase in hearing loss in the U.S. and how a blower’s motor will surely damage my ears—settles the case. I’ll be looking at the battery-powered blowers from now on, and grabbing for the metal rake that’s worked quite well for the last few years. Kathryn Schulz is a staff writer at the New Yorker magazine, and she’s one of the best journalists I’ve read over the last few years. Her feature about the potential of a devastating earthquake in the coastal Northwest, and her reporting about the stink bug invasion, are perfectly excellent. The March 25 issue includes a shorter memoir about her father’s love of books, and how he stacked them up, around, and down the sides of a bedroom dresser. There’s a paragraph in the middle of Schulz’s piece about the novel Middlemarch, which her father regarded as the greatest in the English, and others found near it. “I don’t know if he had completed either of the other two books, or even begun them. But it doesn’t matter, I suppose. No matter when my father died, he would have been—as, one way or another, we all are when we die—in the middle of something.” Sublime. Erin has kept a running list of the wondrous and humorous sayings of our children. She wasn’t with us tonight when, after a long day of travel, Oliver said of this place we’ve come to visit, “There are so many convenient things here that I haven’t noticed before.” I heard him later in bed, reading from a book. Erin alerted me to a heartwarming story about two Ni-Vanuatu women—one a Special Olympics athlete, the other her coach—featured on the Humans of New York site. (Erin tells me Ruby Sinreich alerted her.) Monick, the athlete, won the silver medal for shot put at the Special Olympics World Games in Abu Dhabi. Anna, our daughter, took up the shot put last year, and is throwing again for her senior year. Her first track meet was last week, with others to come. I came across Ruby’s name earlier today as I searched for an old BlogTogether post. Ruby was one of the first bloggers in Chapel Hill, a regular member of our Chapel Hill bloggers meetup, and a speaker at the first Triangle Bloggers Conference in 2005. I was looking for an event we held a couple of years later, a happy hour in RTP to meet Eric Mlyn and hear about the new DukeEngage program he was leading. I wasn’t very good at keeping the BlogTogether site alive, so here’s the post archived in the Wayback Machine. I saw Mlyn’s name in the Duke River of News this week and learned he is stepping down as executive director of DukeEngage. While I waited for the zoning inspector to arrive to her desk at Chapel Hill town hall this morning (I needed to check on a permit for some work up at the house), I watched a maintenance man step to the elevator. He looked up, noticed the florescent light was out, and took out his notebook. I assume he jotted a reminder to file a work order or to tell a co-worker to replace the tube. Later, walking through the hallway at work, I walked carefully past a maintenance man up a ladder twisting a new bulb into a recessed canister. Back home, I saw the tool shed was unlocked, so I stepped inside, wound up a long extension cord I’d tossed inside over the weekend. I reached up and turned on the BioLite SolarHome unit I’d charged with the good sunshine Saturday. I have a light turned on here on my desk as I write this blog post. The rest of the house is dark, the family all in bed. So is tonight’s super worm moon. Like many nights, I will step out the front door to look at the starlight and moon’s glow, listen for owls and coyotes, and breathe in a moment of peace, then go off to sleep and dream. A colleague today gave me an update on myRESEARCHhome and the navigators service, two ways Duke University (with funding from the National Institutes of Health) helps scientists and physicians in their research activities. The navigators are people just waiting to help an investigator find the right resource or understand the correct process. That update reminded me of my Grandpa Sisco, our family navigator who shuttled us around town and to and from the airports and always had the right resource for us—except that one time when I was in high school and I asked him for a mousetrap. “I don’t have any mousetraps,” he reported. Later that night, he stopped by our house and handed me a brown paper bag with two new mousetraps. For the next 20 years, he always had a spare mousetrap in his desk drawer. I was reminded of Grandpa Sisco a second time today during a presentation by a former chief communications officer for Mayo Clinic. Grandpa had been diagnosed with prostate cancer in small-town DeKalb, and his physician referred him to Mayo. The treatment worked, and Grandpa lived an active life into his 90s. In January, when Anna and Malia accompanied me on the trip to Chicago, we flew Southwest Airlines. The flight from Raleigh-Durham to Midway was on a very new, nice, and comfortable airplane. I remember telling the girls how nice it was to have so much leg room. The plane was a Boeing 737 MAX 8. That plane, and all Boeing 737 MAX 8 planes around the world, are grounded as officials study the cause of the crash of Ethiopian Airlines flight 302 on March 10. The Seattle Times has published its investigative reporting about the way the 737 MAX 8 was certified by the Federal Aviation Administration. Aviation crash investigations take time, and the truth may emerge differently than we think we understand the causes and effects today. I’ve loved Boeing jets since I was a boy, watching 707s take off from the Phoenix runway and touring the Boeing visitor center on a family trip from our home in Idaho to Seattle in the late 1970s. (I was a Seattle Supersonics and Dennis Johnson fan at the time; a few years ago, I met the parent of Anna’s classmate, who turned out to be UNC standout Tom LaGarde, also a member of the 1979 NBA champion Sonics.) Even my post about our trip to Australia gushes about the Boeing 787 Dreamliner. I’ll be in the air again soon, hoping for a safe flight and wishing for that spacious seat on the MAX 8. Let’s hope the aviation regulators, experts, and engineers find their answers and solutions so the airplanes in the skies are safe for all. Every two months, a new issue of dwell arrives in the mailbox, and I eagerly sit down with the magazine to read about cool architects, artistic individuals, and the modern homes they build around the world. I’ll invariably see a cool cabin or Scandinavian sauna or sleek wood-burning stove, and I’ll be off on a couple of hours of searching and surfing to find out more. I am keen to build a writer’s retreat out on the back part of our wooded lot, and I dream. A new issue arrived yesterday. I read it on our back deck in the warm sunshine, and was soon learning about the MINIMOD Spot, a perfect contender for the retreat except it’s only available in Brazil and Uruguay, and then I found myself looking at the Muji Hut, but that’s only available in Japan. The Danish wood stoves I could probably get, but they’re expensive. Good architecture and design and craftsmanship should be well compensated. I know a few architects, and have met others, so I suspect that in the end I’ll turn to one of them to solve this itch. Maybe our Peace Corps friend, Kevin Anderson. Or Nick’s sister-in-law, Carina Coel and her Austin-based all-women firm Restructure Studio, which just announced their Arbor Plans project to offer “green-by-design, ready-to-build architectural home plans and Accessory Dwelling Units.” Or Dot’s son, Nathan Hutchins, though he’s designed posh hotel interiors and his firm, Muza Lab is way out of my league. As I said, the writer’s retreat out back is a dream, and a rabbit hole I’ll keep diving into.